Two keys to unlocking great sound in a car stereo system are serious power and extensive control — and this amp's got them both. For power, AudioControl's D-4.800 4-channel amplifier generates 125 watts RMS per channel, so it'll drive even the most demanding aftermarket speakers with plenty of headroom to spare. You could also bridge the D-4.800 to drive a couple subwoofers with 400 watts RMS each. You won't find any knobs on the D-4.800 — you make adjustments and save settings via your laptop (PC or Mac). 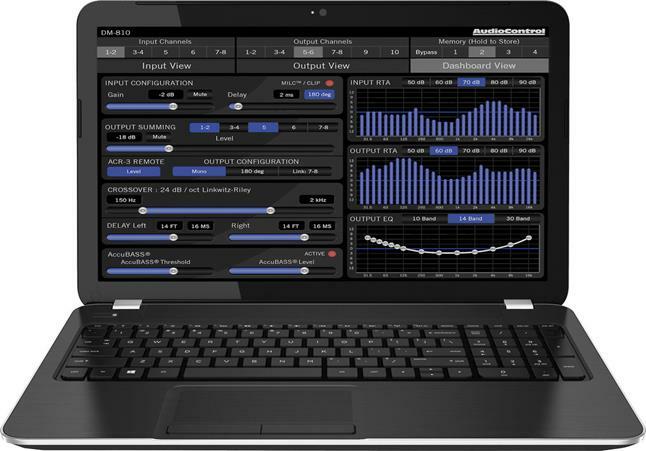 AudioControl's Smart-User DSP software package includes 12 or 24 dB/octave Linkwitz-Riley crossovers, 30-band equalizers, parametric filters, time delay/alignment for inputs and outputs, phase correction, AccuBass™ bass correction, and real-time analyzers (RTA) for the inputs and outputs so you can visually confirm the improvements in the sound. Six active speaker-level inputs allow you to connect this amp to almost any factory system, even ones that have separate pre-filtered, time-aligned, and amplified signals going to separate factory speakers and tweeters. The D-4.800 sums them into one smooth, unified signal for you to balance, align, and tune for your better-sounding aftermarket speakers. AudioControl's Great Turn On (GTO™) signal-sensing circuitry turns the amp on automatically whenever it senses an input, so you won't have to run a separate turn-on lead back to the receiver. Onboard LEDs indicate optimized signal flow for inputs and outputs, plus give you a warning when a source is too loud and causing distortion. An optional ACR-3 wired remote controller lets you select sources, control levels, and recall presets from your front seat.